This is the 8-inch model of the Tab A, which uses the same rather disappointing 1024x768 resolution as the larger 10-inch model. Inside you get a Qualcomm 1.2GHz quad-core processor (presumably a Snapdragon 410 or similar), 2GB of RAM, 16GB of storage, and a 5MP rear camera. The T-Mobile variant obviously includes an LTE radio with bands for the carrier. 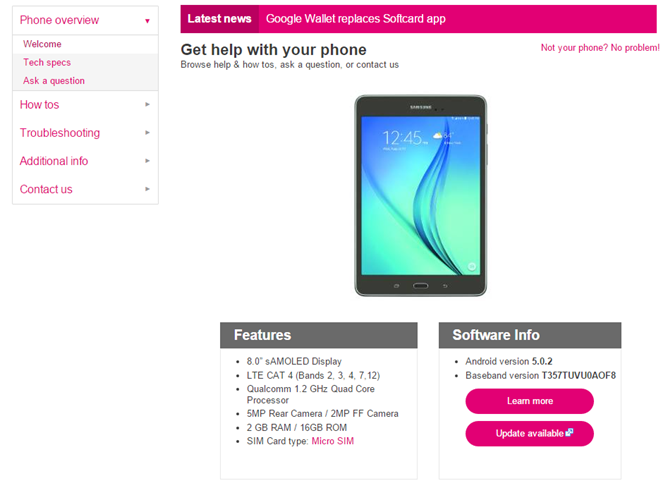 Software is Samsung's customized version of Android 5.0.2, and price is absent, but that's to be expected on a support page. The Wi-Fi version of the tablet costs $230, so I'd expect a carrier variant to start at around the $300 mark. We'll be keeping an eye out for a more conventional announcement from T-Mobile in the near future.